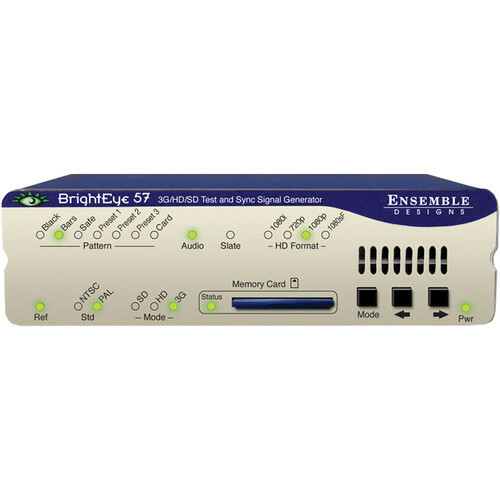 The BrightEye 57 3G/HD/SD/Analog Test Signal and Sync Pulse Generator from Ensemble Designs is a genlockable sync generator and test signal generator that can be used as either a slave or master reference generator. It can lock to house reference or its own internal precision standard. This unit is well suited for use in remote trucks, post-production studios, helicopters, and fly packs, among many other possible applications and settings. 1.5Gbps HD, 3Gbps HD, or SD-SDI test signals or black with embedder is output on the SDI BNC connectors. 3G Level A and Level B are supported. Composite, HD tri-level sync, and AES digital audio outputs are also provided. There are three user-programmable outputs that are selectable between AES, LTC, Word clock, or 6Hz pulse. Analog audio and AES outputs provide tone or silence. 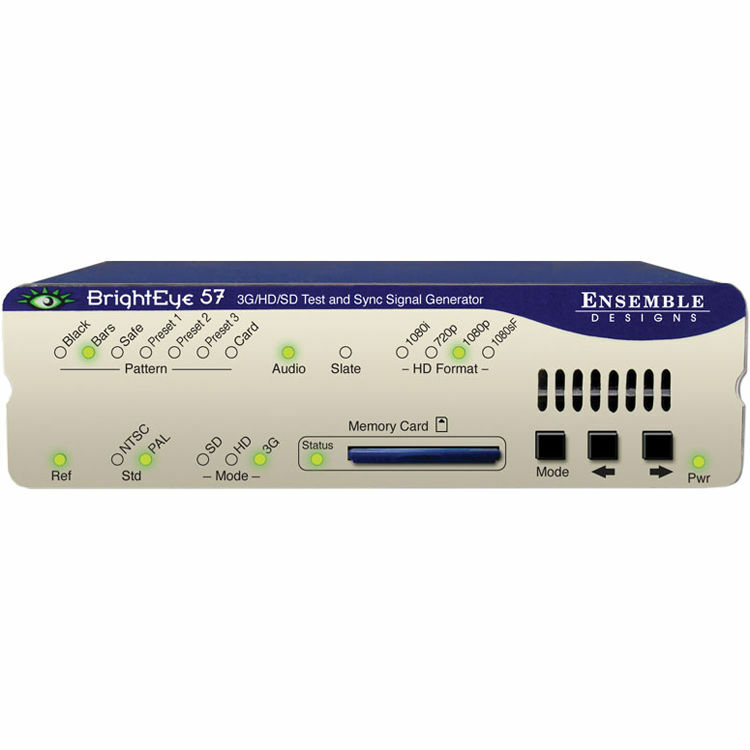 Signals such as Color Black, Bars, Crosshatch, Multi-burst, and SDI Checkfield (Pathogenic) are available simultaneously on the SDI and analog composite outputs. The Cyclops feature adds a motion element to the selected video test signal. An ID slate with user-programmable text can overlay the test pattern. The internal Time Code Generator feeds DVITC on the SDI outputs and VITC on the composite outputs. Time Code can also be selected in LTC form on the programmable Aux outputs. In addition to the standard suite of test patterns, users can create custom test patterns on a computer. Using BrightEye Pattern Generator software, simply transfer test patterns to the included Secure Digital Flash memory card and then insert the memory card into the front of the BrightEye 57. Test patterns can include motion and an associated audio clip such as voice over or station ID. It supports multiple audio file formats, including .tga, .wav, .mp3, and .wma. The unit can be controlled via BrightEye software for Mac or PC. Box Dimensions (LxWxH) 8.7 x 8.0 x 2.4"